After a very early start this morning, we made our way on the train to the James Street Station in Liverpool, which is a short distance from the Echo Arena. 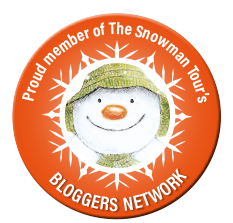 We enjoyed a nice stroll along the waterfront, whilst Riley became increasingly excited as we approached the venue. Everywhere we turned there were children dressed as their favourite Paw Patrol characters and Riley was no exception as he skipped along in his Chase costume. On arrival at the venue, we collected our tickets from the box office and made our way through the bag check and entry line, before being handed a cardboard pirate flag by a member of staff for Riley to wave throughout the show. There was plenty of merchandise on sale including some Tracker soft toys which I have not seen before, but as with any live entertainment venue they were slightly overpriced and fortunately I managed to distract Riley as we made our way past the stall. Our seats were located in the lower tier which provided a great view of the stage. I noticed that the floor seats were all the same level which would have annoyed Riley if there was a grown-up sat in front of him, so I was more than happy with our location as it meant that we could see the stage perfectly. As the start time of 10am approached, the music began to play and we were provided with a 3 minute warning that the show was about to begin. Shortly after the curtains opened and we were introduced to Cap'n Turbot on the stage who gets into trouble whilst trying to take a photograph of the Pirate Parrot. 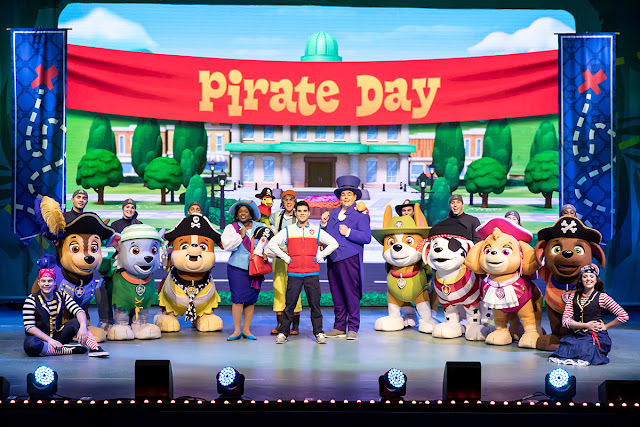 Meanwhile Mayor Goodway, Ryder and the Paw Patrol team are enjoying preparing for the Adventure Bay Pirate Day Celebration with plenty of singing and dancing for families to enjoy. 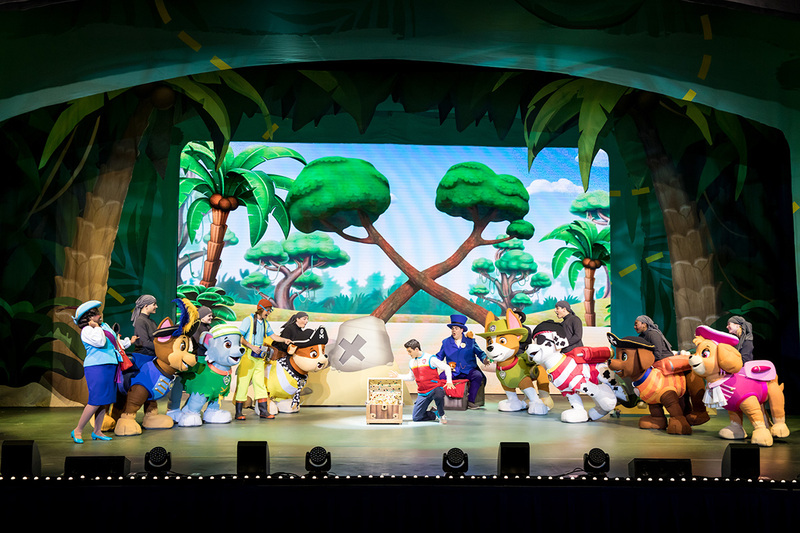 Paw Patrol Live! "The Great Pirate Adventure" allows audiences to join Chase, Marshall, Rubble, Skye, Rocky and Zuma as they embark on a quest to save Cap'n Turbot from a dark and mysterious cavern. However, whilst completing their rescue mission, the pups discover a secret pirate treasure map that leads them on an epic journey to find the treasure, with lots of twists and turns along the way. The sound quality was fantastic and as the loud theme tune echoed around the arena, children were up out of their seats and dancing along. The costumes were superb, just like in their previous tour of Paw Patrol Live! Race to the Rescue and a lot of effort has clearly gone into the production. Riley's face lit up as Rubble & Chase appeared in their vehicles, which again had great attention to detail. 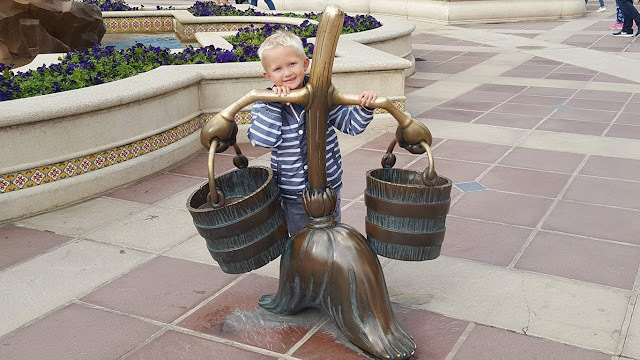 As the Paw Patrol team solved the treasure map clues, Mayor Humdinger created problems, which the team managed to work their way through using each pups special skills. Towards the end of the show the pups found themselves in a sticky situation as they became trapped in sinking sand, but Skye and the fabulous Tracker managed to rescue them much to the delight of the audience! Riley was so happy to see Tracker make an appearance and he loved the song that welcomed him to the stage. The show had a running time of 85 minutes with a 15 minute interval, which did start to feel quite long towards the end. Riley usually manages to sit an hour at a show comfortably so this was a little longer than he was used to, but with the help of some snacks there was no issue and he managed to hold his concentration. He also asked to see the show again as soon as it had ended, so the running time clearly hadn't bothered him. Overall we found it to be a great show that was well suited to its target audience. The costumes, music and scenery were great and the story was very easy to follow. The atmosphere was very relaxed so it was great to see everyone up on their feet dancing and singing along, making it fantastic children's entertainment. *Disclaimer - We were invited as guests to the show for the purpose of providing an honest review of the production. Opinions and thoughts are my own. Meeting Mickey Mouse at Disneyland Paris!